Skate the edge of sanity with Aggressive Inline. Play as top pros like Jaren Grob, Taig Khris and Chris Edwards among others in nine exciting levels expertly designed by the Mirra Franchise's developer, Z-Axis. 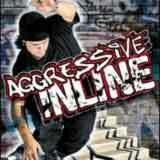 Aggressive Inline will have you travel around levels completing objectives given to you by NPCs inhabiting the level. The completion of these tasks will result in level altering, mind-bending cinematics that continue to open up the level the more you play on. Features Gravity Games and X Games Vert Champion Taig Khris, 2001 X Games Street Champion Jaren Grob, the founding father of Inline Skating, Chris Edwards in additon to Franky Morales, Shane Yost, Matt Lindenmuth, Eito Yasutoko, Sven Boekhorst, Matt Salerno and Sam Fogarty. We have the best of the best in Inline Skating. Introducing the innovative "Juice Meter"; timed levels are a thing of the past, now if you perform a trick your juice meter will raise and you'll be able to continue on, if you can't perform, your juice meter will run out and it's Game Over. 10 to 15 cinematic events per level that makes the worlds really come alive. As an example, if you skate off of the Atlas statue, the massive globe rolls on to the street smashing two buses that form into a half pipe. Over-the-top tricks never seen before in an action sport's game. Six types of manuals, grind transitions, double leg grind, new big air tricks, wall taps, stalls, wall flips, hand plants and much more. Rad soundtrack featuring bands like Saliva, Black Sheep, Reel Big Fish, Hoobastank, Sublime the Pharcyde and others.